We just received some raspberry plants today and have planted them. I'm just curious about basic care- how often to water, how long will it take for them to grow, is this the best time for planting, when should I expect a harvest, ect. If anyone could give me the basic Raspberry 101 guide, I'd really appreciate it! Depending on your climate (ie. How hot it gets.) I'd give them a nice deep watering maybe once or twice a week. Fertilize initially by adding a bunch of compost to the soil then give them a shot of liquid seaweed fertilzer each week. In the Fall, prune back all the woody grow such that the runners can come up unimpeded next spring. 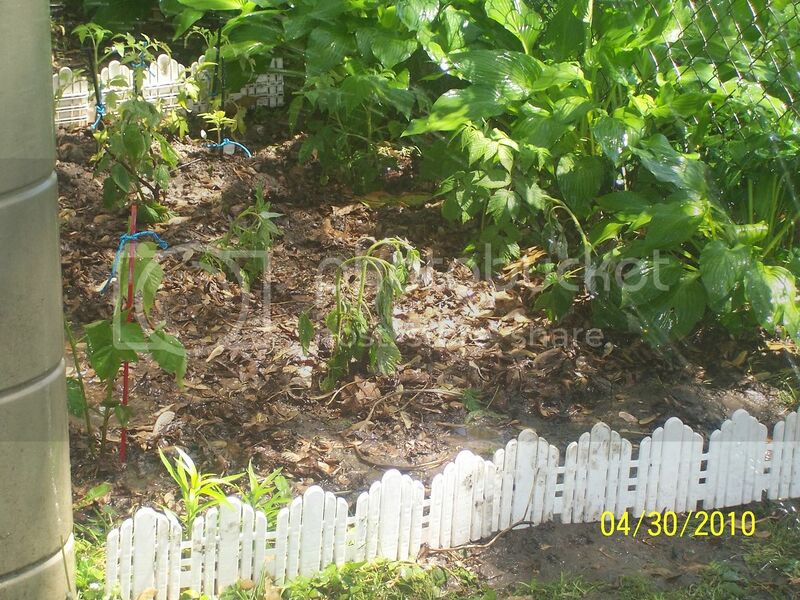 Generally speaking you want to build a sort of "fence" for the plants (that are vines) to grow up. Wire works but, wood is generally a bit better. As the vines grow up, just tuck them behind the rails of the fence. Maybe two or three rails should suffice. If you have everbearing plants you will be harvesting in the summer and fall. If you don't you can expect to start harvesting mid summer and that will be it. After you have pruned your plants back in the fall. Tuck any runners back into the fence then mulch the plants with some rotted chicken manure, grass clippings and mulched up leaves. Welcome to the forum RedheadMaiden!! Glad you could join us! I have copied the information about raspberry care that I wrote for another thread back in January for you - hope it helps. First of all there are two main types of raspberries, summer bearing and fall bearing. If you are unsure right now, which ones you have, treat them as summer bearing until they finish next year, and at least if they turn out to be fall bearing you won't have had a year without any berries. Fall bearing bushes are the easiest to prune, as you do not need to decide what to keep and what to not. After the berries have all been harvested, cut or mow the whole row down to ground level. They will grow back up, and bear again in the fall. Summer bearing raspberries take two years to complete their cycle, and therefore, if you were to cut all of yours to the ground now, without knowing if they were summer or fall, you could end up without any berries for a year. The young, green canes poke out of the ground, and grow over the summer to quite a height (these are called floricanes). In the fall, some people let these branches continue growing as high as they want, and others top them at a more manageabe height (as I do) so that it is easier picking. Topping them also encourages bilateral branches from the sides of the canes, giving you a higher yield of berries. In the spring, your canes that grew nice and tall over the past summer, but did not bear any berries should be left in the garden. They will now bloom this year, and bear lots of berries for you. Then in the fall, you will see that you now have two types of canes. (if you just moved in and the raspberries haven't been taken care of, you probably have this stage now). Some are the nice new green canes that have not had berries this year, and some may already be dying or dead, but even if they are not yet, their stem will be brown or a greyish color. These old canes need to be cut out right to the ground. They are finished and will not bear fruit again. You should just be left with green canes (floricanes) again. Your raspberries will continue this ongoing cycle, year after year. Most people also use different ways of staking their raspberries as they can get unwieldy if just left. Some put a heavy, tall stake at each end of the row, run a line to both, and then tie each individual cane to this line. This is called a T trellis. Others place several tall,heavy stakes along both sides of the row (the number would depend on the length of the row) about every six feet. Then a line is run all the way around these stakes, making a sort of cage. The line can be run at several heights, if your canes are different heights. This is call a hedgerow trellis. Other people just let them grow their own way and let them do their own thing. Raspberries will tolerate alot of hot dry weather, but while blooming, and especially while bearing fruit, require alot of water. The less water you give them at this point, the smaller your berries will be. Also, if you get hot glaring sun all day, try to somehow provide them with a little shade during the harshest time of the day to prevent scalded berries. Raspberries, like all plants have their own special soil needs. They prefer deep, sandy/loam soil, although they will grow in almost any soil. The PH level for them is between 6 and 7, and they like a high level of organic matter. Enjoy your raspberries - they are delicious!! Thank you both so much for filling me in on the raspberry care! I really appreciate the time you took to do so. It will be extremely helpful in months to come! May God bless you! Not a problem! That's what the forum's all about! Feel free to drop in anytime if you have question, answers, or just want to chat!! The door is always open! I moved into a house a couple years ago, there are many raspberry plants running wild in the backyard by the creek. This part of the yard is taken over by wildlife, etc. But I make paths to get to the berries. I really would like to have all the berries in one spot. I wanted to know if I can transplant them? Or would they die? Also, I had no clue how to prune or anything. I have never done any gardening. So, I need all the help I can get in kindergarden terms! I read the previous posts, and did learn alot. Can I still cut them back since its almost April? Do I cut them to the ground even though they are huge & have been bearing fruit for many years? What is the green & brown? I bought rootblast for them, and some fruit food, is there anything else I can do to help get a better crop? Thank you so much in advance for helping me out! I never had a green thumb and always wanted one, so I figured this is a good start!!! I just discovered a patch of raspberries starting, where I didn't even know they were. I kind of like where they have decided to grow, so I am going to clear around them and let them have the spot. They grew in a patch of weeds, small trees, brush you name it, it is there. And seems my wild raspberries are always with blackberries, no idea why. For 2010, I am simply going to clear around them. Put in posts and some wire to kind of keep them to one area, because they are really close to my garden beds. And let them grow, when they finish fruiting, then I will remove all old canes, you will know them, they are the ones that really hurt when they poke you. The fresh young canes, while unpleasant aren't as stiff and therefore not as painful. Also the coloring will be different. If you really need to know, just tie a colored string on the ones that are fruiting, then you have a reference point come late summer when you want to remove the old ones. I wouldn't mark them all, just enough to give you an idea what you are looking for. I don't mind that my raspberries grow many feet, if you simply bend the tips over, and lay a rock on it, they will root and establish, more raspberries, it is that easy to propagate them. And they still have the parent plant to feed them while they grow roots. Later you can cut them apart, after that cane fruits it will die anyhow, but not the roots that you started! Mine will be trickier to do, since I also have blackberries growing in the patch with them. But same rule, get rid of old canes. If you wear heavy gloves, sometimes you can grab the old, obviously dead canes, they have no leaves on them, and just yank them right out of there. Wait till the good canes leaf out and you will know. I've been reviewing the postings about care of raspberry bushes, would like to put some in this year. Sounds like they can be invasive! I don't want to intrude into my neighbors yard. Do lots of gardening with perennials, but never fruit bushes or veggies (other than tomatoes). I live in Chicago suburbs-- hot humid summers, dry in August, alkaline soil. My thought for plant location was sunny corner in backyard with cyclone fence on both sides. Currently have some ornamental grasses there which I will move. Should I edge off site with something to prevent invasion into neighbors yard? Everbearing bushes or just summer or fall? Would current fence be OK for staking or should I do more? i recently bought and planted some red raspberries. every morning when we wake up they are standing straight up robust at attention by 11 am they are wilted and falling over. we have watered them sooooo much im worried about root rot. Hmm... Raspberries do prefer well drained soil. I'm assuming I see puddle of water there because you just watered? How often do you water? Is it possible that you ARE watering too much? -- as in too often -- and not letting the soil dry? The area appears to be clay soil. The other concern is the shade it's in. Raspberries like it hot and sunny. Blackberries can take some shade and clay soil. Yes the soil is rather heavy, as far as the sun it hits them heavy in the morning but by 11a.m. or so they start getting half shade. Yes I did just water them a short time before the pic. was taken. In the morning from 7 to 9 or so a.m. they are all standing upright and look great but by 10 they start looking wilted so we water them, pretty heavy soaking, then they usually perk back up a little bit by 3 or 4. We then hit with water again around 6-7p.m. They have only been planted there since last Sunday. What should we do not do or add anything? I have three Heritage bushes in my 6 by 8 raised garden bed. They are now in a line, but it looks more like 1 large, long shrub, instead of three. I hacked it down to about 18 inches this spring. They have grown to about three feet already. I was thinking of putting in four metal stakes, and "sandwiching" the bushes between wire, perhaps two wires at three and again at four or five feet. Is that a good idea? I can try something new next year, but I don't want to thin them out this year or do anything drastic, since this is the second year and we would like the two batches of fruit. Any help or advice? Keep in mind that most Blueberry Bushes require at least one other bush, usually of another cultivar, to properly cross-pollinate in order to produce any significant number of berries. A few varieties, such as Tifblue, are considered self-fertile in that they do not require another bush to pollinate with. I've posted some information I found online that helps explain basic Blueberry care. 1. Plants that do not cross-pollinate can produce a few berries each growing season. But once two different varieties of blueberry bushes pollinate each other, the amount of fruit they produce jumps dramatically. Cross-pollinated bushes produce between 12 to 24 pounds of fruit per plant. 2. Every blueberry bush features both male and female organs on the same plant. But the plants do not pollinate themselves very easily. Instead, the plants cross-pollinate with other bushes that grow within 100 feet of each other. 3. Blueberry bushes fall into varieties that produce mature fruit in either early, mid or late-summer. To harvest fruit all summer long, some gardeners plant all three varieties. Pollination takes place between the plants no matter when the flowers bloom or the fruit matures.